They say there's little evidence that Maine's industry has had a negative impact on the whales' survival rates and that more positive population forecasts are being ignored. The math of protecting right whales from extinction is scary stuff: The stakes are high, scientific opinion varies and some rescue plans could make it impossible for lobstermen to earn a living. Getting that math right matters when the futures of right whales and Maine’s lobster industry are so closely intertwined. Right whale numbers have dwindled to about 450 because of deadly ship strikes, fishing gear entanglements and low birth rates, while Maine’s lobster industry is the backbone of the state’s coastal economy, raking in about $434 million from landings in 2017 and generating another $1 billion for Maine in post-dock revenues. “This will be the largest challenge for this industry,” said Commissioner Pat Keliher of the Maine Department of Marine Resources. Those who fish for lobster in Maine and manage the fishery claim that their side of the whale story, and peer-reviewed species projections, are being lost in the extinction din. Regulators claim they already have a right whale management plan in place and that it’s working. Despite the industry’s size, and the up to 3 million lobster traps in the water, no scientist or whale advocate has ever linked a whale death back to Maine’s lobster fishery, Keliher said. Dead whales have washed ashore in Maine, but they can swim for miles before they die, and carcasses can drift, too. No dead whale has ever been found in marked Maine ropes, officials say. “None of the mortalities have any relationship back to the Maine fishery,” Keliher said Thursday at a Lobster Advisory Council session on right whale strategy. Fishermen and regulators in Maine are clear: They’re willing to do even more to protect right whales, but they don’t want to be blamed for a problem they are not causing. On that front, they point directly at Canada. Twelve right whale deaths were reported in Canada last year, including several entangled in snow crab fishing gear. None of the five U.S. mortalities in 2017 could be traced back to fishing gear. One whale was struck by a ship, and the other four died of unknown causes. Just this month, Canada announced some new snow crab fishing protections for right whales. But it has yet to change any of its lobster fishery regulations. Maine fishermen and regulators bristle when they hear scientists advocating for additional U.S. protections talk about the potential for functional extinction of the species. That would be Mark Baumgartner, an associate scientist at Woods Hole Oceanographic Institution, who presented his right whale extinction math to a jam-packed hall of lobstermen last month at the Maine Fishermen’s Forum. Unless something is done to prevent the 2017 death toll from repeating, Baumgartner fears that ship strikes and fishing gear entanglements will kill off about five of the population’s 105 breeding females a year, resulting in “functional extinction” by 2038. His math tells him that the world has years to figure out a way for whales, fishermen and ship captains to coexist, not decades. “The longer we wait, the harder the problem will be to fix because every female you kill, you kill off all the calves that she could have had if she’d lived a full life,” he said. When Baumgartner does his calculation, he uses the inferred mortality rate – the difference between the number of right whales counted from one year to the next, minus the number of new calves reported – to estimate that 20 right whales die a year. 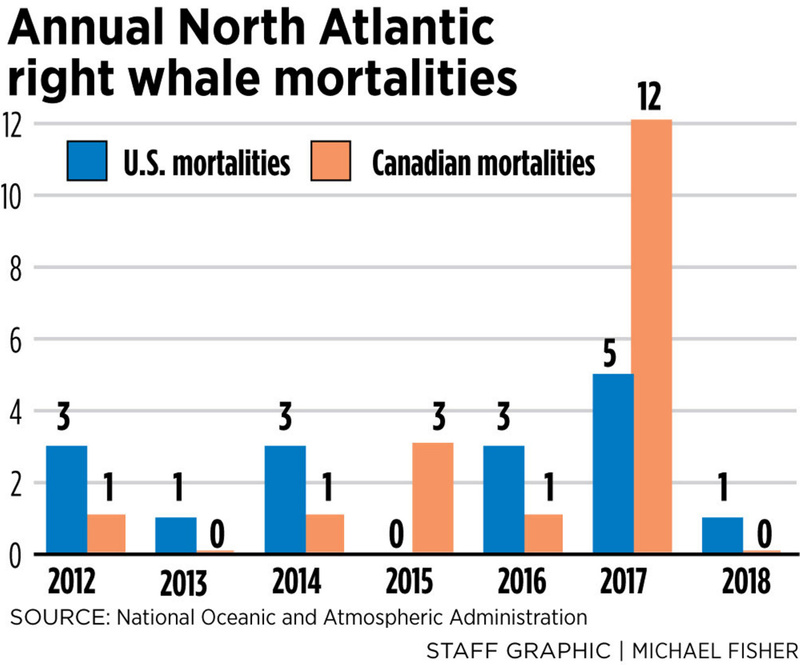 That’s much higher than the three or four right whale deaths reported in a typical year, or even the 17 reported dead in 2017, which almost everyone agrees was catastrophic. Baumgartner and other Woods Hole scientists have been repeating this functional extinction claim at forums and seminars across the country, driving Maine scientists like Erin Summers, who heads up right whale research and policy development for the Maine Department of Marine Resources, more than a little crazy. Just last week, at the regular Lobster Advisory Council meeting, she described it as a “back of the envelope calculation” that hasn’t been published or reviewed by other scientists. 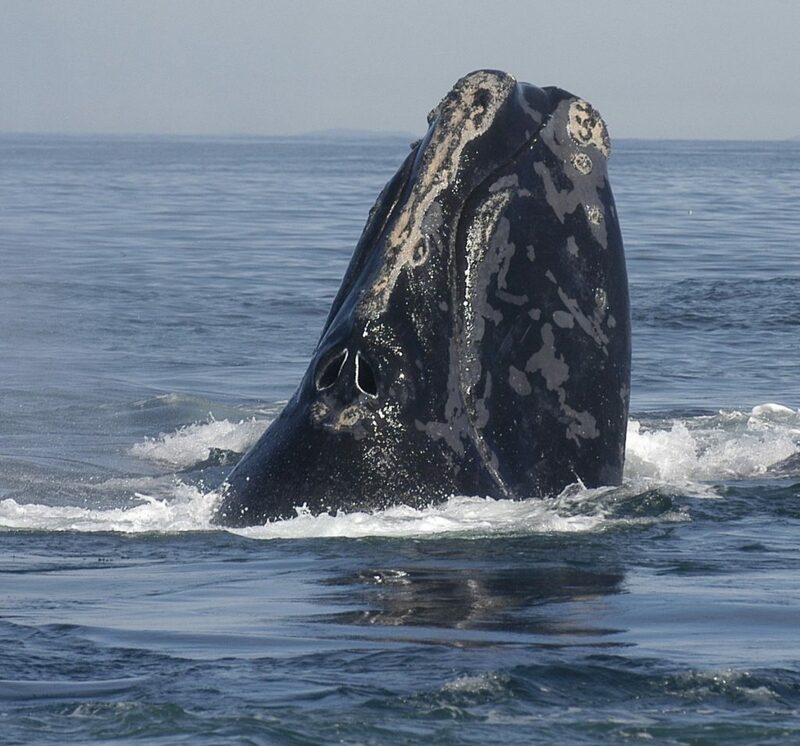 Right whales have rebounded from far lower numbers than the present estimate of about 450, Summers noted. In 1997, when the right whale management plan was first adopted, scientists estimated there were only about 295 whales left. The stock rebounded to 476 whales in 2011, largely through lowering the boating speed limit in areas where whales congregate. The U.S. lobster industry also changed the way it deployed its gear to minimize entanglement risks. Baumgartner’s math drives Summers crazy, but it makes Patrice McCarron of the Maine Lobstermen’s Association, the state’s largest trade group, increasingly upset as she reads the sound bite in one national or international magazine story after another. The industry doesn’t want to draw any more attention to the right whale issue than it’s already getting, but she said fishermen are tired of being pummeled in the court of public opinion. “It’s hard to compete with a Ph.D. from Woods Hole who is willing to just make up that whales are going extinct,” McCarron told the Lobster Advisory Council on Thursday. McCarron doesn’t begrudge Baumgartner his opinion, and she certainly doesn’t want the lobster industry to sound anti-whale, because the industry is doing its best to be a partner in whale protection efforts. The future of the industry is tied to the fate of our oceans, McCarron said. Lobstermen take great pride in being stewards, not just of the brand’s worldwide reputation, but of the fishery itself, so it will be there to pass down to their children and grandchildren, she said. But effective regulatory measures need to be tied to good data, McCarron said. If every Maine lobstermen had pulled all of their gear out of the water last year, 17 whales still would have died, she said. Maine lobstermen are willing to do more, but they don’t want to sacrifice their time or any of their livelihood for a new rule if it won’t make a difference to a species that some scientists say is already recovering, and whose fate has more to do with food than fishing gear. In a paper published in Global Change Biology last year, Erin Meyer-Gutbrod of the Marine Science Institute of the University of California, Santa Barbara, predicted this endangered species can slowly recover as long as no more than nine whales die a year. That is a conservative estimate, based on the low availability of their favorite kind of food, copepods, the kind of plankton that females eat to get fat enough for calving. With normal food availability, the species could withstand up to 12 deaths a year. These aren’t numbers to strive for, she notes. But it would bode well for the species, which saw an average of 6.6 whales die a year between 2012 and 2017, according to federal data. While Maine may prefer Meyer-Gutbrod’s published forecast to Baumgartner’s calculation, both scientists admit there are still many unknowns in both approaches. For example, the cause of death cannot be determined for some dead right whales, which makes it hard for regulators to know which risk factors are the most important to target. Maine lobstermen believe they are being targeted for additional restrictions because they are one of the few variables that federal regulators and environmental groups can control. Environmental groups filed suit against the federal government this year, claiming it is not doing enough to protect the right whale. Mortality is only one half of the right whale population math, however. Unfortunately, scientists know even less about right whale reproductive habits than how, where or why they die, Summers said. Meyer-Gutbrod has concluded that food availability plays a role – as the Gulf of Maine warms, whales that once fed on copepods here are now moving into the less regulated and thus more dangerous waters of the Gulf of St. Lawrence to eat, and may be too tired and thin from the longer swim to mate. But right whales that are injured by entanglements – and Amy Knowlton, a right whale researcher at the New England Aquarium, claims that scarring observed in catalog photos of the right whale population suggests that 85 percent will run into fishing gear in their lifetimes – may be too stressed to mate, which suggests that entanglements may contribute to the lower reproductive rate of the species. 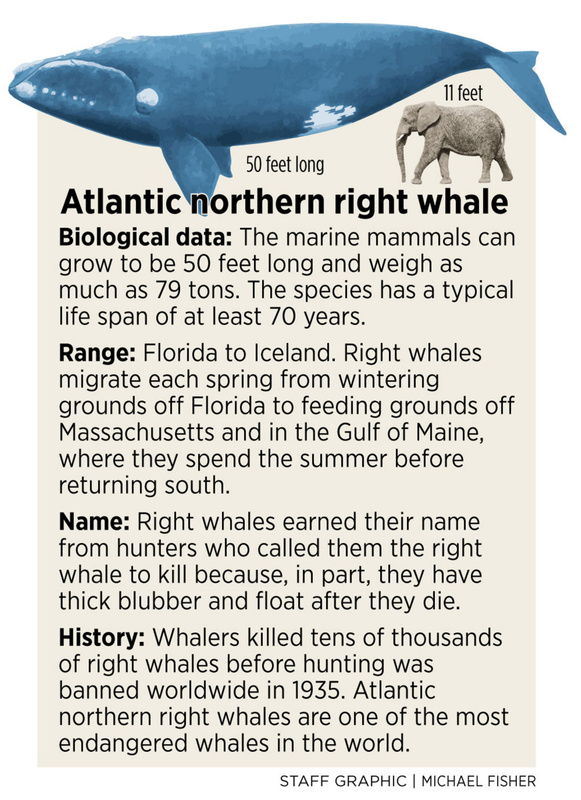 Scientists announced this month they had found no evidence of a right whale birth in 2018. If the low birth rates of 2017 and 2018 become the new norm – five calves reported in 2017 and none in 2018 – the species may be vulnerable to extinction if even fewer than nine whales a year die, Meyer-Gutbrod warned. She is running her population models again now based on a wider range of calving rates, food availability and governmental policies, and hopes to have those published soon. When asked about Meyer-Gutbrod’s work, Baumgartner said he thinks her findings are consistent with his when taking into account today’s higher mortality rates. “What I take away from the paper is that if given the chance to recover, right whales will recover, but we need to reduce mortality rates to give them that chance,” he said.